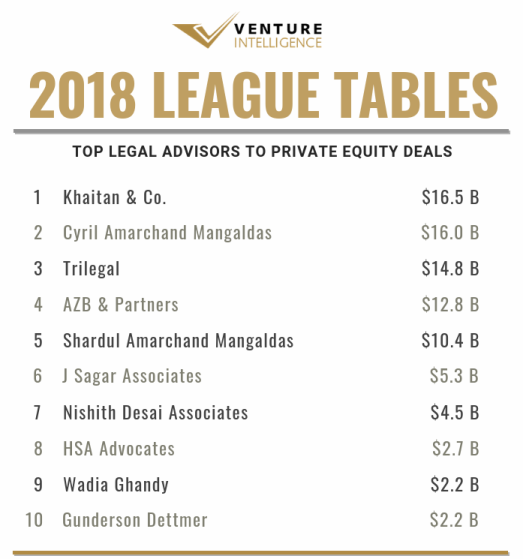 Khaitan & Co. topped the Venture Intelligence League Table for Legal Advisor to Private Equity Transactions in 2018. Khaitan advised PE deals worth $16.5 Billion (across 55 qualifying deals) during the period. 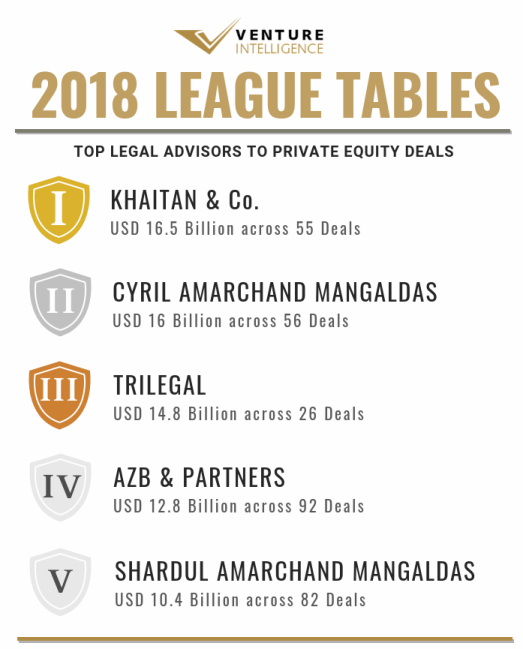 Cyril Amarchand Mangaldas (CAM) ($16 Billion across 56 deals) and Trilegal ($14.8 Billion across 26 deals) took the second and third spot. 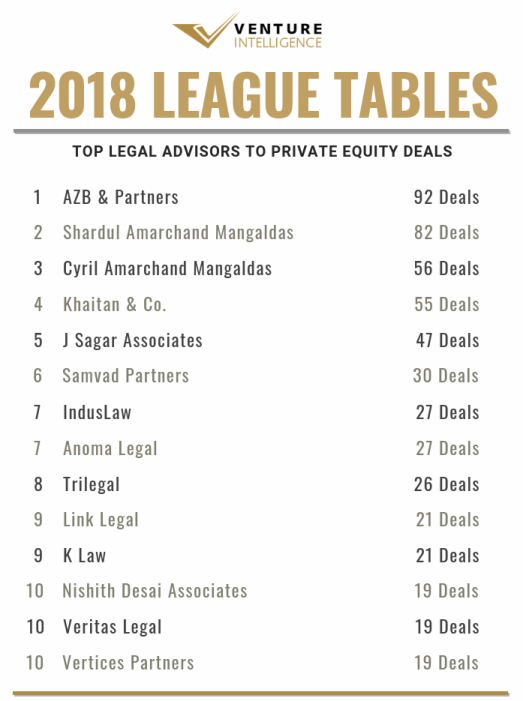 AZB & Partners ($12.8 Billion across 92 deals) and Shardul Amarchand Mangaldas (SAM) ($10.4 Billion across 82 deals) completed the top five in 2018. The top three legal advisors had advised investors and promoters in the $12 Billion exit from Flipkart. Apart from the Flipkart exit, Khaitan & Co. advised deals include Temasek's $760 million acquisition financing of Schneider Electric's buyout of L&T Electricals & Automation division and Apax Partners' acquisition of Healthium Meditech. CAM advised deals include Kravis Kohlberg Roberts' (KKR) acquisition of Ramky Enviro and CDPQ's $367 million investment in CLP India. Trilegal advised deals include L&T Electrical - Temasek deal and the Naspers led $540 million investment in Byju's. Among foreign firms, Gunderson Dettmer came in at the top advising deals worth $2.1 Billion (across 7 deals). Jones Day came in second advising the $1.2 Billion infusion by Abu Dhabi Investment Authority and TPG in UPL Limited. Simpson Thacher & Bartlett came in third advising 6 deals worth $1.1 Billion. AZB topped the tables in terms of deal volume notching up 92 deals during the year, followed by SAM with 82 deals. CAM took the third place advising 56 deals. Khaitan and J. Sagar Associates (JSA, with 47 deals worth $5.3 Billion) occupied the fourth and fifth place respectively. Among PE transactions in IT & ITeS (by value), Khaitan stood first followed by Trilegal and CAM. SAM and AZB came in at fourth and fifth. By deal volume, SAM stood at first place with 28 deals followed by Khaitan. Samvad Partners stood third with 23 deals followed by new entrant Anoma Legal (with 21 deals) and Novojuris, IndusLaw and CAM (with 20 deals) in fifth place. HSA Advocates topped in Infrastructure deals with $2.7 Billion, followed by AZB and Bharucha & Partners. CAM came in fourth, followed by JSA in fifth place. AZB (with 13 deals) topped by deal volume, followed by SAM, CAM and Economic Laws Practice in second place with 5 deals each. In Financial Services, AZB topped the table with $3.1 Billion, followed by SAM (with $2.2 Billion). Wadia Ghandy and Nishith Desai Associates (NDA) came in third place with $1.7 Billion followed by CAM (with $690 million). JSA took the fifth spot with $445 million. SAM topped in Healthcare & Lifesciences advising deals worth $1.1 Billion, followed by Khaitan in second place and AZB in third place. NDA and Luthra & Luthra occupied the fourth and fifth place. In Real Estate, AZB topped with $2.1 Billion, followed by JSA with $1.3 Billion. SAM occupied the third place followed by DV Associates and CAM.